Hotel Tonight is a hotel booking app available on the Appstore and Google Play that finds hotel rooms available in your area. If you are a new user, you will get a free $56 credit. All you need to do is sign up through the link above and select Italy as the country. Then use code “ITALIA” in the promo code box which will add 40 euros ($56) to your account. Now download the app on your phone and change your currency settings to US Dollars. This is a 2.1 Channel Multimedia Sound System w/ subwoofer that has amazing reviews . This is refurbished, however it is a great price at $100. So, if you are looking for a cheap sounds system you might want to check this one out. 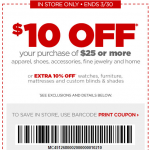 JCPenny has an in-store coupon for $10 off $25 that is valid until Sunday 3/30/14. 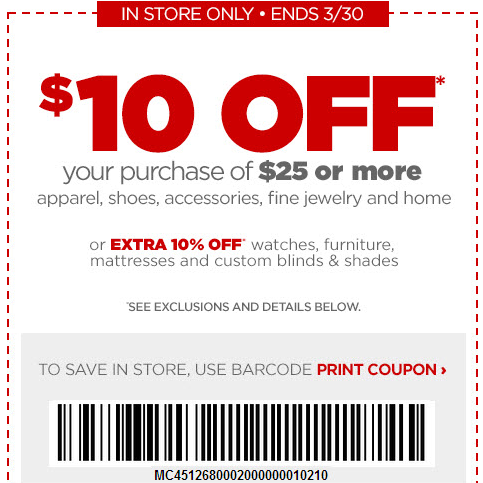 So if you plan on shopping at JCPenny this weekend, it wouldn’t hurt to bring this coupon along.